When you’re the youngest of eight children, survival is the key! That’s probably why I learned the value of food early in life. I simply love food and cooking and have found that in this world of abundant food messages, sometimes TMI isn’t a good thing. I am here to weed through all of the food messages that we are confronted with everyday. Shopping tips, menu suggestions, local food treats, the latest food catchwords and trends; come here to find out about all things food-related! 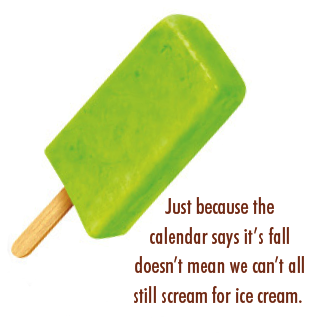 Just because the calendar says it’s fall doesn’t mean we can’t all still scream for ice cream. It’s a great way to brighten those warm fall weeks when we leave the beach or pool and return to school and work. I have to admit, some of my earliest and favorite childhood memories involve ice cream. It is the one dessert that “always goes down” and still somehow always makes me feel better — it’s the ultimate treat any time of year. For health and calorie-conscious consumers, “real” creamy indulgences may be regarded as “forbidden” treats of the past. That doesn’t have to be the case, however. For dieters, diabetics, non-dairy eaters, “real” ice cream lovers and everyone in between, there are some great options to enjoy. Follow me on my local ice cream tour, which even includes directions on how to make frozen treats in your own home! If a trip to Italy was not part of your summer vacation, you can get a taste of it right in the center of Westfield at the Chocolate Bar, which features homemade gelato made by owner and chocolatier Neil Grote. For those not in the know, gelato is much lower in fat than ice cream because it is made with 80% fat-free milk and only a small amount of heavy cream. A 4-ounce serving of basic gelato has only 3-4 grams of fat. On my little tour, I got to check out the imported Italian machines that were churning delicious creamy “soup” that smelled so good it made you want to dive right in! The gelato is made fresh daily, and the shop features 25 flavors that are rotated regularly. There are classic Italian flavors like stracciatella (chocolate chip), nocciola (hazelnut) and tiramisu, as well as ones with an American flair, including cookies & cream, peanut butter or “the works.” (Of course classic flavors like Neil’s truly scrumptious chocolate gelato are always a hit. )If you’re looking for something non-dairy and gluten-free with no artificial colors or flavors, the fresh fruit sorbets are a great, refreshing choice too. No matter what time of year you stop by the Chocolate Bar, there is “always something good and new,” says Neil. I have to agree, and it’s typically the first place I head to as a special after-school treat for the kids. Another local stop on my tour for some creamy treats was the Cranford Vanilla Bean Creamery, which opened in the spring under the new ownership of Ralph Kopelman. Here you can find a real full-fat creamy indulgence when you need one, and an occasional indulgence is not a bad thing. In fact, it can actually be a good thing to indulge every now and then; it helps you stay on a healthier diet regime if you don’t feel completely deprived. To make you feel even better, all of what Ralph has to offer — about 40 flavors in total — is made on the premises and, like the Chocolate Bar, is all fresh with only “real” ingredients. No added artificial colors or flavors are to be found in the ice creams or sorbets. In fact, the only thing green you might find in his mint chocolate chip ice cream is a fleck of fresh mint! (Some of Ralph’s kid flavors of Italian ices are the exception.) For kids who love soft-serve and Italian ices, which are excellent low and no-fat options, this must. For the blood sugar conscious, there are sugar-free ice creams as well. Both of these establishments tempt you with seasonal offerings and a constant rotation of flavors. Fresh and real are what’s most important to this ice cream lover, and both offer exactly that. The freezer section of any supermarket seems to have expanded with our waistlines! There are simply a huge variety of frozen treats. Here is my advice for picking out some tasty but still healthy frozen treats: avoid artificial flavors and colors — go for all-fruit bars or Italian ices and sorbets, particularly for kids. For lower-fat ice cream, try “slow -churned” in any brand. They have half the fat of traditional ice cream, so you lose the “bad” saturated fat but get all the creaminess. Another option on your trip to the grocery store is to stock up on a few basic ingredients that you can use to make your own frozen treats at home. Shake Up Some Homemade Ice Cream! This is a great activity for kids & the easiest way to whip up some homemade fun (& burn calories while you’re at it!) Note: if it’s still really hot outside, I recommend doing this indoors or you will need to shake it longer. Combine the sugar, half-n-half, & vanilla in 1 Ziploc™ bag & seal tightly. Combine the ice & rock salt in the other Ziploc™ bag. Place the bag of cream/liquid inside of the ice/salt bag & seal. Hold tightly to the edges & SHAKE the bag until the mixture turns into ice cream! This will take at least 5 minutes shaking time. Tip: Double bagging both is recommended to prevent any salt from getting into your ice cream bag. Additionally, you may want to wear gloves, as it gets pretty darn cold! If after shaking for at least 5 minutes it is not getting solid, it will definitely make a delicious real milkshake instead! Add sprinkles, candy, nuts, or fruit & enjoy! Super-fast, super-easy, super-good! It honestly doesn’t get easier or faster than this simple combo that makes a delicious & healthy dessert or snack any time of year. It is not quite a smoothie & not quite a frozen treat, and it should be consumed immediately. I make a quick trip to Trader Joe’s for these ingredients. Treat yourself to some September scoops, either at home or in a local shop! Enjoy! 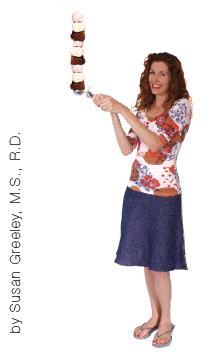 Susan Greeley, a registered dietician of 15 years, received her Master of Science in Nutrition Communication from Tufts University in Boston and Bachelor of Science in Dietetics from Miami University in Ohio. She is a nutrition writer and consultant as well as the staff nutritionist for the Westfield Area YMCA. Susan lives with her husband and three children in Westfield and is working on a cookbook of her own.